2018 Mitsubishi Outlander Sport owners will experience a vehicle that provides a sleek look with modern easy-to-use technology and great fuel economy. Featuring many upgrades from the previous year, the 2018 Mitsubishi Outlander Sport comes with standard with automatic climate control, comfortably sits five passengers and it has one of the most robust warranties on the market. The 2018 Mitsubishi Outlander Sport lineup consists of four trims, the Outlander Sport ES, Outlander Sport LE, Outlander Sport SE and Outlander Sport SEL. All trims are available with front-wheel-drive or Mitsubishi’s specially designed all-wheel-drive system called All-Wheel-Control (AWC). The 2018 Outlander Sport lineup includes two engine options and two transmission options. The base engine is a 2.0-liter DOHC I4 engine that generates 148 horsepower and 145 lb-ft of torque and it powers the Mitsubishi Outlander Sport ES and Outlander Sport LE trims. The Outlander Sport SE comes standard with a five-speed manual transmission and the Outlander Sport LE comes standard with the automatic CVT Sportronic transmission, which is an available upgrade on the Outlander Sport SE. The engine gives the Outlander Sport ES and Outlander Sport LE an average fuel economy of 23 mpg in the city, 30 mpg on the highway and a combined city/highway fuel economy of 27 mpg. The second engine option is the 2.4-liter DOHC I4 engine and it produces 168 horsepower and 167 lb-ft of torque. DOHC standard for “double overhead camshaft” and it is a type of engine design that has two camshafts instead of one and it helps the engine operate efficiently. The 2.4L engine is standard on the Outlander Sport SE and Outlander Sport SEL and it is paired to the automatic CVT Sportronic transmission. When the Outlander Sport is equipped with the 2.4L engine it averages 23 mpg in the city, 29 mpg on the highway and it has a combined city/highway fuel economy of 25 mpg. The available All-Wheel-Control (AWC) system transfers power and braking to the vehicles four wheels with the most traction to improve handling and performance without drastically reducing efficiency. All 2018 Outlander Sport trims are equipped with 11.6-inch ventilated front disc brakes and 11.9-inch solid rear disc brakes, and they are coupled with a four-channel Electronic Brake-force Distribution to provide superior driving and stopping performance. Brake Assist, Active Stability Control and Traction Control Logic are built into the vehicle’s monitoring systems and equip the vehicle’s solid control. The 2018 Mitsubishi Outlander Sport has a lot of standard exterior features that make the Outlander Sport stand out from other crossovers on the market and make it a practical and safe vehicle. Some of the exterior features that are standard on all 2018 Mitsubishi Outlander Sport trims include heated power side-view mirrors, a rear window wiper and defroster, a spare tire, and LED rear combination headlights. Other exterior features are available on select trims or available upgrades. The Outlander Sport LE, SE and SEL all come standard with fog lights, and the Outlander Sport SEL and Outlander Sport LE come standard with high-intensity discharge (HID) lights and buyers of the Outlander Sport SEL have the option of a sunroof. The Outlander LE is the only trim with the Limited Edition badge and it is also the only trim with black accents and it has black wheels, black folding side-view mirrors with turn indicators, and a dark alloy fuel door. All Outlander Sport trims equipped with the CVT transmission have an ECO Indicator light that visually aides drivers showing when they are effectively saving gas depending on the route they are taking. Other useful interior features include a 7-inch touchscreen display and a rear view camera. Standard features on the Outlander Sport LE, Outlander Sport SE and Outlander Sport SEL have heated front seats, Apple Carplay with Android Auto, automatic dual-zone climate control and two USB ports. 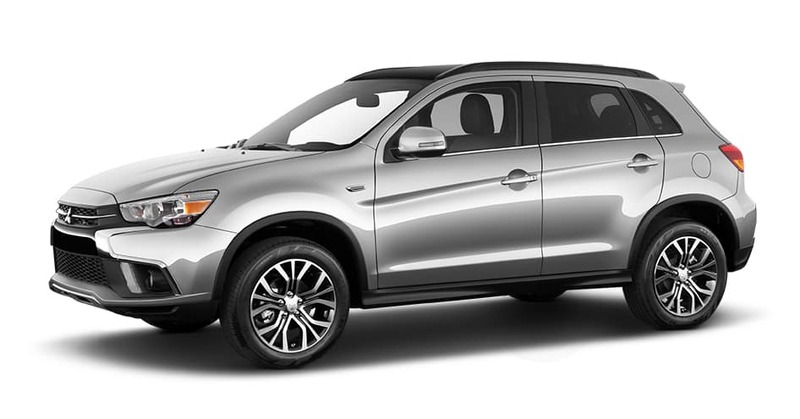 The Outlander Sport has a spacious cabin and it comfortably sits five passengers. The Outlander Sport ES and Outlander Sport LE come standard with cloth seats. Heated front seats are standard on select trims and a 60/40 split-fold second row is a great convenience feature that allows users to reconfigure the back area when extra space is needed for large cargo. Immaculate sound provided by the Rockford-Fosgate 9-speaker system is available on the Outlander Sport SEL 2.4 as now all trims come with a 7-inch display screen with a rearview camera, and a 6-speaker system is standard. Apple CarPlay and Google Android Auto come standard on the Outlander Sport SE 2.4 and SEL 2.4, and Bluetooth wireless technology and steering wheel mounted phone, audio, and voice controls are a lineup standard. The base trim, ES 2.0 has a 4-speaker system, the Outlander Sport SE and SEL have a 6-speaker system. For the 2018 model year, three automatic safety features have been added as an option for the Outlander Sport SEL 2.4 – automatic high beam headlights, forward collision mitigation, and lane departure warning. All other safety features remain. Forward Collision Mitigation helps to prevent, reduce and negate all together accidents with warnings if a person or vehicle too close or at unsafe distance ahead and applying brakes automatically, if necessary. Available Lane Departure Warning (LDW) system uses an onboard camera to monitor lane position in front of the vehicle, audibly and visually alerting the driver if the system notices the vehicle leaving its lane unintentionally. Available Auto High Beam Highlights will enhance your drive when in dim lighting, sporadically lighted areas. The best warranty in the industry with a 10-year/100,000 mile Powertrain Limited Warranty, a 5-year/60,000 mile fully transferable New Vehicle Limited Warranty and 7-year/100,000-mile Anti-Corrosion/Perforation Limited Warranty and 5-year/Unlimited Miles Roadside Assistance. Univeristy Mitsubishi is located between Miami in Fort Lauderdale, and we have a great selection of new Mitsubishi models. Visit University Mitsubishi to test drive a brand new Mitsubishi Outlander Sport today.